I am so bummed. I was supposed to spend this week relaxing and reading for Bout of Books. I signed up and wrote my goal post and everything, but my body decided to crap out on me instead. Rather than reading, I spent the week with H1N1. Let me tell you- it was no fun. Even with the Tamiflu my doctor called in for me, I was still miserable and felt like I was dying for a good majority of the week. I tried reading a few times, but I was just too exhausted to even hold a book in my hand, so I finally had to just give up on the read-a-thon this time. Bummer. But the good news is I'm finally feeling a little better. I had my first OB appointment and we did a quick ultrasound to double check my due date (which was off and had to be adjusted). I got to see the tiny little baby growing inside me! 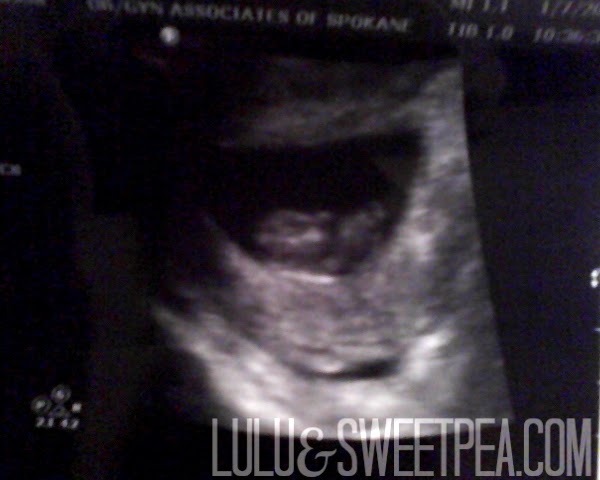 He/she looked like a little gummy bear wiggling around and had a healthy heartbeat of 170. The baby was laying flat & the head is on the left, the body and legs are on the right. In two more weeks I'll go back and have another ultrasound, and this one will be a "real" one where we'll get to see a lot more and get some better pictures. How's it like where you're at? Has the flu been crazy? I know a ton of people with it right now! I have been sick on-and-off ever since Christmas. Not fun. I thought I was getting better, but after spending the day yesterday in London with our middle girl at the museums, the lurgy appears to be having a second go at me. Not fun. I had H1N1 a few years ago and it was awful! The kids and I barely moved from the couch for at least a week. I am glad that you're feeling better! We finally got a new house!